Considered to be the finest American diamond found up to that time (1880), the 153.50-carat rough this stone was cut from came from the claim of Mr. Porter-Rhodes in the Kimberly Mine. It was valued at $200,000. In 1881, Mr. Porter Rhodes visited the Osborne House on the Isle of Wight and showed it to Queen Victoria, who exclaimed over its great purity and beauty. 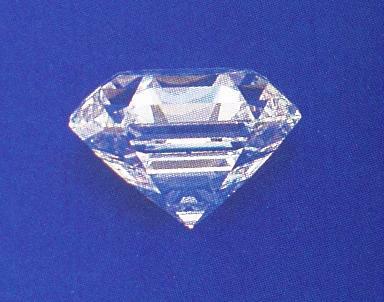 Empress Eugénie, who also saw the great diamond at the same time, remarked that it was "simply perfection," not knowing what to compare it with. 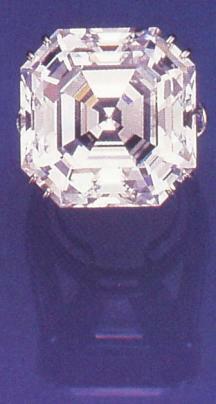 At that time, it was the general belief that South Africa diamonds were inferior. Victoria asked, "Is it really from Cape?" Eugénie remarked, "Are you sure the diamond is from South Africa, and have you not had it polished a little? I have always been under the impression that diamonds from the Cape were very yellow and worth but little." 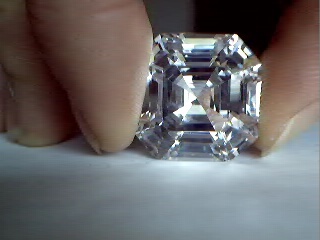 The Porter Rhodes, out of its ring setting, circa late-1980's. 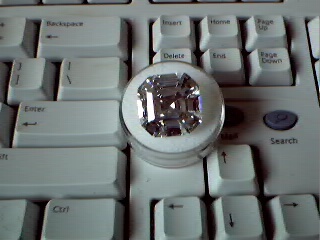 A replica of the Porter Rhodes, cut from colorless cubic zirconium. I bought it from NW Diamonds & Gems. 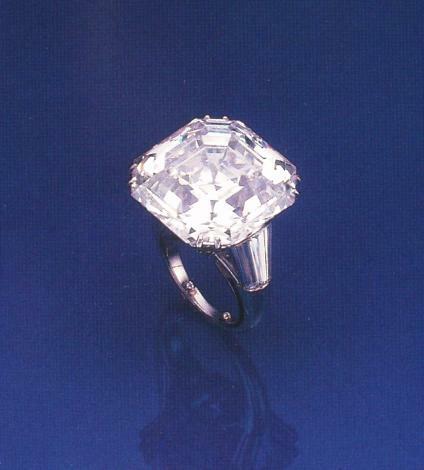 The diamond was faceted into a 73-carat Old Mine cut, but eventually was sold to the London jewelry firm of Jerwood & Ward, who had it recut in Amsterdam down to a 56.60-carat Asscher cut. It was sold to the Maharaja of Indore, a man of great wealth who abdicated in 1926 in favor of his son after a scandal had erupted over his fancy for a certain dancing girl. In 1930 the second Duke of Westminster bought the gem, the first of a long line of collectors. It later came into the possession of an influential American family who treasured the diamond for three decades before selling the diamond to Lawrence Graff in 1987. Graff repolished the Porter Rhodes into the 54.04-carat gem which you see here. The gem has been graded as being D-color. One could argue the Porter Rhodes would be too large for a ring, but here it is.